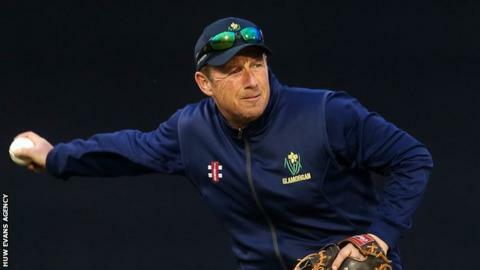 Glamorgan head coach Robert Croft says the club is aiming to develop "sustained success" by fielding young players, despite five consecutive Championship defeats. The club is adrift at the bottom of Division Two of the Championship. "We need to take a step or two back to give these lads the opportunity to find their feet at this level," said Croft. "When they do, we'll have a nucleus of players that will give us sustained success." After criticism on social media, Croft says the strategy will also bring "performances all Glamorgan supporters will be proud of". Glamorgan are without a trophy since winning the limited-overs National League under Croft's captaincy in 2004, and have been in the second division of the Championship since 2006 despite a brief promotion challenge in 2015. They have fielded 10 Welsh-developed players in their early 20s, among 23 Glamorgan have used in the Championship in 2018, but the number of young batsmen grouped at the top of the order has been problematic. "Over the past 12 seasons, Glamorgan have averaged seventh in division two - that's where we're at and we have to buck the trend," Croft told BBC Sport Wales. "That's [either] with a lot of senior players having been brought in, [or] without a lot of senior players. "For us to have any sustained success going forward, we have to make sure that we build a nucleus of Glamorgan-developed players. "It will be good to add some seniority to buck that trend, but do we want to finish seventh for the next 12 years as well?" Former England spinner Croft has a number of former playing colleagues around him on the coaching staff, with ex-director of cricket Matthew Maynard as batting consultant, David Harrison as his assistant, and Steve Watkin and Adrian Shaw mostly on second-team duties. "We have a coaching staff that covers all bases - it's our responsibility to give [players] our knowledge and keep them looking forward to each game as an opportunity," said Croft. "It doesn't happen overnight, but, yes, we would want it to happen quicker." Glamorgan have home matches against Gloucestershire and Leicestershire, plus a trip to promotion-chasing Kent to come. The Welsh county are without a Championship win since April, and would probably need to win two of those games to avoid finishing bottom. "There's still a lot to play for, but there's no hiding away from the fact it's been very disappointing for us and everyone who supports Glamorgan," said vice-captain Chris Cooke. "Results are important, but it's crucial to get our performance back up and actually compete in games, then results will follow."